Published: Jan. 5, 2019 at 05:55 p.m.
Houston Texans quarterback Deshaun Watson misses wide receiver DeAndre Hopkins on a slant in the end zone. Published: Dec. 16, 2018 at 01:47 p.m. 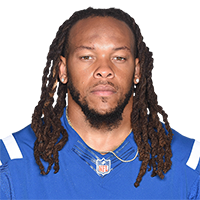 Published: Nov. 5, 2017 at 04:31 p.m.
Indianapolis Colts outside linebacker Jabal Sheard causes the fumble and linebacker Barkevious Mingo recovers it to end the team's Week 9 victory against the Houston Texans. Published: Oct. 2, 2017 at 01:58 a.m.
Indianapolis Colts safety Matthias Farley picks off Seattle Seahawks QB Russel Wilson's pass intended for tight end Jimmy Graham.